All Night I lay with Jockey / The Peacock followed the Hen, Jacky Layton, Green Breckons / Bob and Joan / Kiss Her Under the Coverlet, Cuckold Come Out the Amrey, Cuddy Claued Her, Holme's Fancy / Stagshaw Bank FairLasses / Pass the Brandy, Cut an Dry Dolly, Over the Border, Pheasant's Dance / Rusty Gully, Keelman Over the Land, I Saw My Love Come Passing By Me, The Barrington Hornpipe / The Glen Aln, The Wild Hills O'Wannies / The Swallow'sTail, Jim Hall's Fancy, Breamish / Random Jig, Archie's Fancy / Little Hennie, The Lea Riggs, Sir Sidney Smith's March, Mrs. Elder, Nae Gud Luck Aboot the Hoose, Oh Dear What Can The Matter Be?, The East Neuk of Fife, The Locomotive / The South shore. The words above, (or ‘Small Pipes’, as it carelessly says on the side titles) are what you get on the front and sides. 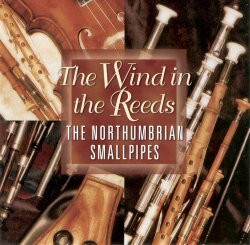 Again on the back; then followed by the tracklist - 23 sets of mostly a selection of the standards of the Northumbrian pipes repertoire, with a small sprinkling of good modern titles in the idiom. Then, in pretty small print, the names of the musicians: Alistair Anderson, Jim Hall, Anthony Robb, Carole Robb, Colin Ross. Goody! Top musicians playing classics! Read a bit further, and we see that the CD ‘traces the history of the instrument’s music’, and ‘features the whole range of sound and repertoire from solos to full band arrangements from some of the finest players’. It’s not till you rip off the cellophane and read Colin Ross’s useful but short introductory essay that you find that what you have got is a reissue of two albums, from 1975 and 1980, of the Cut and Dry Band, Cut and Dry Dolly and Cut and Dry#2. This is Good News and Bad News. The Good News is that these are very welcome reissues of recordings made by important artists at a point towards the beginning of their discovery of, and involvement with, a distinctive music - and as such are seminal recordings in the remarkable revival of interest of the native music of the North East that is bearing such wonderful fruit today. These are recordings that any person with more than a passing interest in the development of British traditional music would be delighted to have; and I’m sure they are recordings of practical interest to students of the instrument. They are also fascinating to listen to in light of the development of Smallpipes playing in the intervening 20-25 years, both by the musicians concerned, and by younger successors. The playing is always competent, and often considerably more than that; but Billy Pigg it isn’t! The sheer expressiveness achieved in the playing of traditional music in later years by these players and the likes of Kathryn Tickell, Adrian Schofield, Pauline Cato, Chris Ormston and so many others doesn’t seem to be nearly so developed at this stage. The Bad News, however, does seem to me to undermine the record pretty seriously. An the Bad News is the notes and the presentation. I can see that in editing the available tracks to make a CD with as wide an appeal as possible to the non-specialist market, one would want to come up with a track order that would have variety; no real problem there. However, the two LPs from which the tracks are drawn were precisely defined. The first, Cut and Dry Dolly was specifically devoted to the music written for the one-octave plain chanter instrument, and showcases the music, mostly from the mid-eighteenth century, which grapples creatively with the restriction of the span of one octave. The second, Cut and Dry#2 presents a selection of tunes written for the extended range of the keyed chanter which came into use from the early 19th century, and also includes a few modern tunes. The problem is, that there is no indication on the CD as to which collection the tracks are sourced from - sure, you can listen to hear if the tunes span more than an octave’s compass, and (I’m fairly sure) most of the plain-chanter instruments have a generally more robust intonation. But the effect of mixing the tracks without attribution works against the effect of demonstrating the development of the instrument and the tunes. Hmmm… now, listening again carefully, I think that tracks 1 – 11 are probably from the first LP and 12 –23 from the second. But I’m not going to delete the above paragraph, because I think the point still stands. Particularly worth clarification would be examples like Nae Gud Luck Aboot the Hoose (track 20), a solo, which only uses a few notes outside the octave compass in some of the variations and Oh Dear What Can the Matter Be? (track 21) a duet which uses extra octave notes in the second part. Which leads to the next gripe: that the musicians are not attributed. The tracks are a mixture of solos, duets and ensembles. None of the tracks lists the players for the track. From the list of band members, we can deduce who’s playing fiddle, concertina, flute, piano or viola when they appear; but all five play the pipes. Maybe not serious for a tourist compilation, but for a source/reference record, it is. And the next: the tunes aren’t referenced, either. I suppose most players and enthusiasts will know most of the tunes, but at least the new ones should be given their composers - Billy Pigg’s Archie’s Fancy, Will Atkinson’s Glen Aln (Hornpipe), James Hill’s The Locomotive etc.